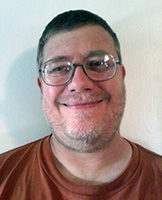 ORLANDO, Fla. – The parking lot of an Orlando-area convenience store resounded Dec. 9 with chants of “Wawa, escucha! / Estamos en la lucha!” (rough translation: “Wawa, listen! / We mean business!”) and “Wawa, shame on you / Farmworkers are people, too.” About 40 farmworker allies targeted the Wawa store in an action in solidarity with FLOC – the Farm Labor Organizing Committee (AFL-CIO) – and agricultural workers on tobacco farms in North Carolina. 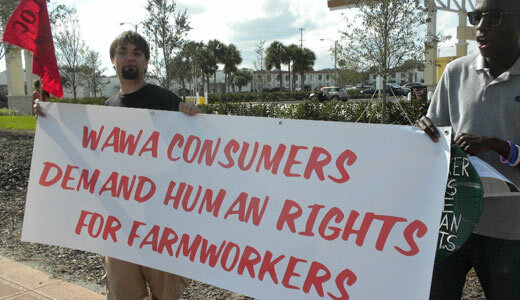 The activists wanted to remind Wawa, a major mid-Atlantic convenience store chain which recently moved into the Florida market, that those farmworkers are part of its supply chain. Wawa’s 600 stores sell cigarettes made by North Carolina-based Reynolds American from tobacco grown and harvested by the farmworkers. This, say the activists from YAYA (Youth and Young Adult Network of the National Farmworker Ministry), gives Wawa a responsibility to take steps to help improve the farmworkers’ living and working conditions. “Although Reynolds American does not directly employ farm workers, because it contracts with tobacco growers it has the ability to influence grower standards that directly affect the living and working conditions of farm workers, both within its supply chain and even beyond,” YAYA explains. YAYA’s action was planned to coincide with International Human Rights Day (Dec. 10), the 66th anniversary of the adoption of the United Nations Declaration of Human Rights, which guarantees the rights of free association and of workers to join a union. The Dec. 9 action also was prompted by the repeated refusal of Charlene Marko-Heim, Wawa’s Florida regional manager, to meet with YAYA. A delegation from YAYA went into the store to deliver the letter, which included another request for a meeting with Marko-Heim. The Oxfam America/FLOC report, “A state of fear: Human rights abuses in North Carolina’s tobacco industry,” found that farmworkers experienced widespread wage and equal pay violations in North Carolina’s tobacco fields. Of 103 farmworkers, some of them undocumented, who were interviewed for the report, 22 (about one in four) reported that they were paid less than the federal minimum wage of $7.25 an hour. Fifty-one reported being paid the minimum wage while only 11 said that they earned more than the minimum wage. Undocumented farmworkers toiling side-by-side with those who had H-2A (agricultural) visas reported that they were paid less the H-2A workers, whose wages were set at $7.25 to around $10 an hour, depending on location. Other groups with a presence at the Dec. 9 action included SLAP-Student Labor Action Project, from the University of Central Florida; Central Florida Jobs With Justice; and Dream Defenders, a recently-formed Florida-based activist group of progressive students and young people.